Hi to All, I can't believe Christmas is nearly upon us. Luckily I have very little to do this year and was organised enough to buy all my gifts online and in time. It's just as well because like many parts of the country, Oxfordshire has taken a hit with the snow. The weekend was bedlam on the A34 with hours of tailbacks. It's Tuesday again and we have a new theme over at the Everybody Art Challenge Blog. This week the challenge is to make a handmade gift. 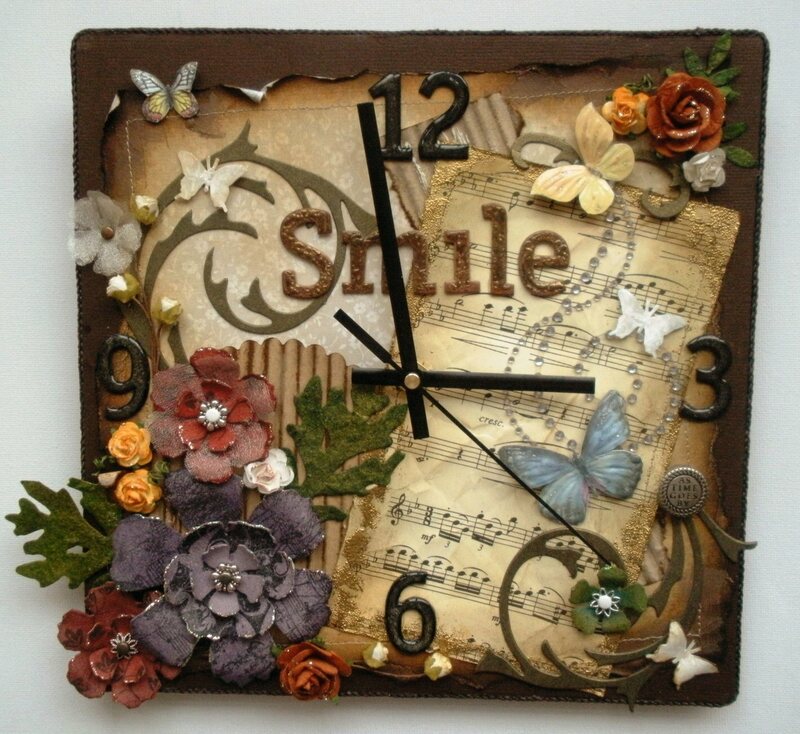 I knew exactly what I was going to do having bought a couple of components to make a clock at the NEC craft fair in November and I am really pleased with the outcome. To make the swirls and flowers I have used Grunge Paper and two Tim Holtz dies inked with distress inks and stamped with various stamps. The numbers are white chipboard coloured with black ink and embossing crystals x 3. I have used the same technique on the word SMILE and coloured with Mica Powder. Extra flowers have been added purchased from Wild Orchid Crafts, butterflies from my stash, swirl gems and a Tim Holtz button. I hope you can join in this week. This is a short post to let you know that we have an excellent sketch to follow over at the Everybody Art Challenge Blog. Check out the DT for more beautiful inspiration. The image is carol singers from LOTV coloured with Copics and stickles glue. It's so cute and very detailed, it did take me a little time to colour but was worth it in the end. 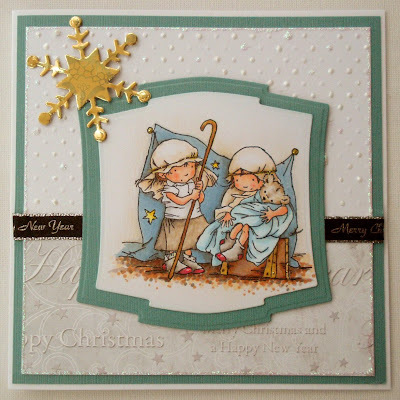 I have used Kraft corrugated card for the base, layered with paper from Basic Greys Eerie, Jovial and Wassail pads. I have distressed the papers using inks and scissors and a little sewing. The punched detail was made using red paper and a Martha Stewart punch. The sentiment is a digital image that I own, edged with stickles glue for sparkle. The flowers are also edged with stickles. Finally I added a pearl gem in each corner.